What thoughts come to mind when you watch your baby sleep? “What a little angel?” “I have the cutest baby in the universe!” “He’s finally asleep!” Designer Gwen Gardner asked the question, “What’s inside of you?” while watching her daughter take a nap. 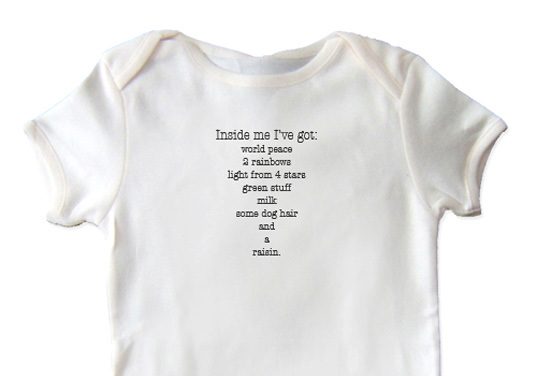 Her answer came as a poem entitled, “Inside Me,” which she placed on a onesie. It reigns as the bestseller in her 100% organic cotton baby clothing line, Little Chickie Wear, which features fanciful designs and playful expressions. Each piece of clothing in the Little Chickie Wear collection, which includes onesies, T-shirts and hats for boys and girls size 3 months to 6T, is a veritable work of art. All handmade in the U.S.A., Gwen bases her creations on inspirations gained while observing her daughter and other children. She cuts her designs from paper that she collects on her world travels, and uses paint and gems to add embellishments. Each original rendering is then graphically arranged by computer and transferred to clothing. The witty artistic expression in the collection ranges from cheeky phrases: “May contain peanut,” and “I’m going to run with scissors,” and environmental stances, “Locally Grown,” and “Hand Wash Only,” to pastime promotions rarely found on baby clothing, “Ski Bum,” and “Nauti-Girl” which adorably features pictures of whimsical sailboats. 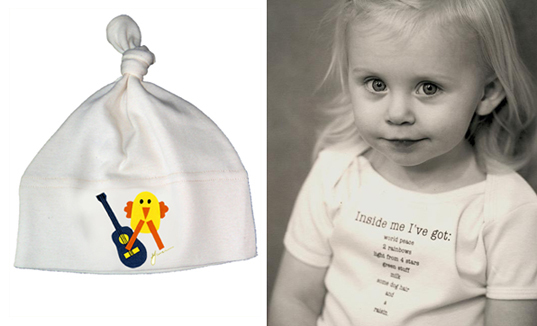 Little Chickie Wear decorates children in hip, fresh duds and preserves the planet and the health and safety of our children with the use of 100% organic cotton. We all know our kids “ought to be in pictures,” and dressing them in Little Chickie Wear allows life to imitate art. What thoughts come to mind when you watch your baby sleep? "What a little angel?" "I have the cutest baby in the universe!" "He's finally asleep!" Designer Gwen Gardner asked the question, "What's inside of you?" while watching her daughter take a nap. 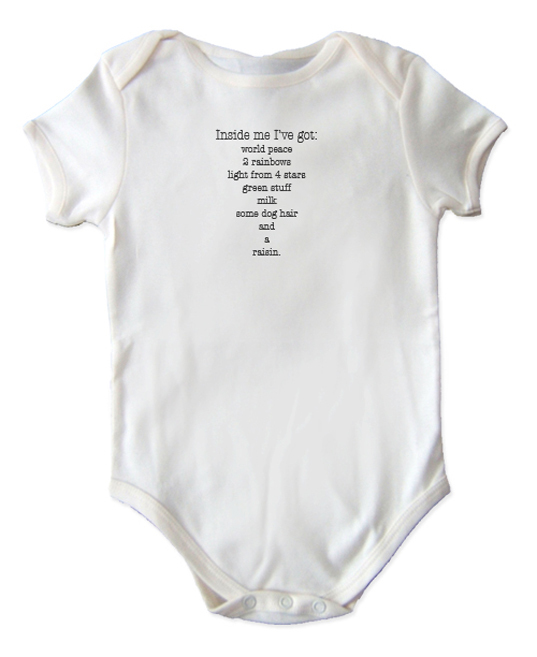 Her answer came as a poem entitled, "Inside Me," which she placed on a onesie. It reigns as the bestseller in her 100% organic cotton baby clothing line, Little Chickie Wear, which features fanciful designs and playful expressions.